Requires ElvUI 11.00+ installed. Get it here. The installer will run the first time you enable the addon or after ElvUI install ends. You can run the installer anytime, by clicking the Install button in BenikUI options. Any install step can be avoided, thus keeping your current settings. All options are in light blue color inside ElvUI options; currently in actionbars, unitframes, player and target portraits. BenikUI looks better with ThinBorder Theme enabled and 1920x1080 resolution. Slow: Report issues at the comments below. Please try to reproduce any issues with only ElvUI, ElvUI_Config, ElvUI_BenikUI enabled. Suggestions, recommendations, things to add/remove or to say thanks, at BenikUI site in TukUI.org or on the comments section. AddOnSkins, so that your addons fit with ElvUI and BenikUI style. Location Plus for ElvUI for player location frames and moar datatexts. ElvUI Nuts and Bolts for more cool features. ElvUI VisualAuraTimers for statusbars in player buffs, debuffs. ProjectAziroka Square Minimap Bar/Buttons to show the minimap buttons in a neat, removable bar. 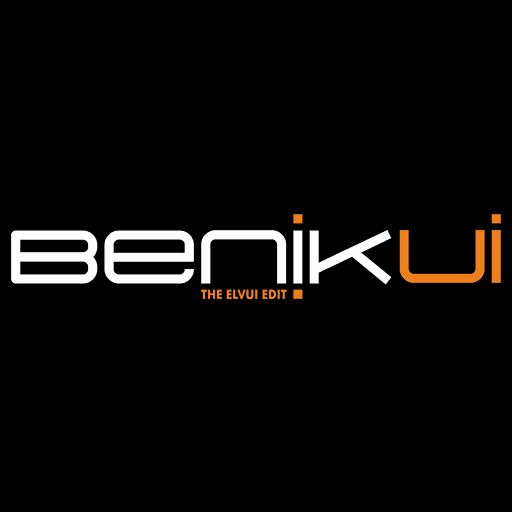 Compatibility: BenikUI collaborates with most of ElvUI plugins. Decors all ElvUI and Blizzard frames. NEW! Shadows on all ui elements, including Nameplates, AuraBars. Also on DBM and BigWigs bars. Replaces all Blizzard font instances with the default ElvUI font. The decor can be Enabled/Disabled, recolored. Different colors can be applied in Actionbars decor. 3 frame backdrop color themes plus the default ElvUI. 'Diablo' (dark red), 'Mists' (dark green), 'Hearthstone' (dark blue). 3 Unitframes and 3 Actionbars layouts. Can be applied and combined during the install. System Dashboard that shows ms, fps, memory, durability, volume. Volume can be adjusted by left/right click - mouseover the speaker icon. Tokens Dashboard based on AsphyxiaUI. Buttons beside the chat datatexts, that can show Addons - LFG (left chat) and Game menu - ElvUI options (right side). Shift and mouse over the cornered buttons, will show an arrow to hide the chat (like ElvUI does). 2 Small mouseovered buttons on the actionbar decor (bar 1 or 2), that can show/hide bar 3 and 5. "Request Stop" button that appears while on flight path. "Notifiers" add a small arrow and percentage beside the vertical xp/rep statusbars. Options to change XP/Rep bar colors. Profiles for Skada, Recount, Details, DBM, ElvUI VisualAuraTimers, AddOnSkins, MSBT. I like this addon, but i really want to hide the system dashboard and the proffession dashboard - how do i do that? I've looked at Reddit, and people suggest it's /elvui > BenikUI > Dashboards, but this option i do not have... Any suggestions? It's been reported before and the culprit is that you might have installed an outdated ElvUI addon. So, disable all the addons with ElvUI in their name, except ElvUI, ElvUI_Config (these two are the main ElvUI ones) and ElvUI_BenikUI and the option you need will be there. After that, you can re enable your other ElvUI addons one by one, to grab the one that is causing the issue. Hello i have a problem with my target frame, you can see on the picture i want my debuff on the bottom left of this frame, so i put this in the option but actually they are very far on the left. Someone can explain me why ? That's an ElvUI related question but anyway, if you want your Target (or Player) debuffs to show in a separate position, you must goto ElvUI -> Unitframes -> Target (or Player) -> General and disable "Smart Aura Position", then in ElvUI -> Unitframes -> Target (or Player) -> Debuffs -> set "Attach to" -> "Frame" and "Anchor Point -> "Left". You also might need to play with x and y Offset. Having "Smart Aura Position" enabled, one of the things it does is that the debuffs will always be placed above Buffs and when there is no Buff present, the Debuffs will show where the Buffs are set to. thank you a lot !!! struggling with this little problem for so long ! I have only ElvUI, Elvui_Config and ElvUI_BenikUI enabled. Thank you so much, your file fixed it. Thank you for your work and regards. Thanks for reporting back. Appreciate it. I have one problem on npc name. If I choose v3 on progress, npc name is changed like blizzard style. After that change, I can't change it again like elv style. I want to choose v3 with elv style npc name. If it is possible, please let me know about it. Or if it is real bug, please announce it and fix it. I'm Korean, and I'm not good at English. If and when I use rude or strange expression, I'm really sorry about that. I do my best to write this respectfully, and correctly. Also, in instances, friendly nameplates for any addon, are disabled due to Blizzard limitations after patch 7. Only the default Blizzard friendly nameplates can be shown. Keep me posted and include a screenshot in your next reply, in case I missunderstood your issue.